Your one stop online shop for everything beady and creative for your jewellery making projects. 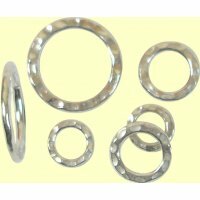 Hi, we are BeadAddict and since 2001 we have been suppliers of quality components to make your handmade jewellery special and unique. We specialise in genuine Venetian Murano glass beads and pendants sourced from beautiful Venice in person, we also stock Karen Hill Tribe Fairtrade fine silver, 14kt Gold Filled beads findings and charms, Swarovski Crystal beads and pendants, 925 Sterling Silver wire and components, Freshwater Pearls, Czech glass fire polished beads, a great range of semi-precious stone beads, 925 Bali Sterling Silver, Beadalon stringing wire as well as a variety of other stringing options, Solid copper beads and findings and many other gold and silver plated components including lots of unusual and hard to find components, findings, beads and stringing materials. We stock a large range of 925 sterling silver findings including lobster, trigger and toggle clasps, both open and closed jumprings, a variety of headpins for making earrings and pendants, sterling wire & crimp beads and a range of other jewellery findings are also available in 1/20 14K gold fill as well as pure copper, sterling silver vermeil (vermeil is high carat gold over sterling silver) and gold and silver plated components and findings. We also offer a range of books to help inspire you with your handmade jewellery making adventures! Whether you are making to sell or to make a special piece of jewellery for yourself or someone you love, BeadAddict has lots to offer you - we start with good quality photographs to make choosing your beads and findings on BeadAddict as easy as possible and our newly revamped website is now mobile friendly as well. To You will find comprehensive hints and tips and glossary sections in the footer of our pages to help turn your handcrafted jewelry projects into great earrings, bracelets or necklaces and lasting keepsakes. As a family owned and run small business we pride ourselves on our personal service and love our close connection with the Murano and Venetian glass bead making industry - we have arguably the largest Murano glass bead collection on offer for sale on the internet in the UK - we hope you will enjoy browsing BeadAddict and look forward to seeing you soon. 1 Karen ribe Silver Little Starfish Charm with Hanging Loop measures approx. 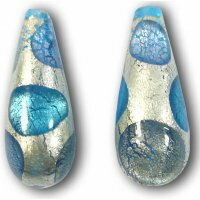 17x13x5mm detail ..
1 Murano 24kt White Goldfoil Extravagant Drop - Sapphire, Aquamarine and Black Diamond – j..
1 Murano Glass Blue Vortex Goldfoiled 20mm Heart. 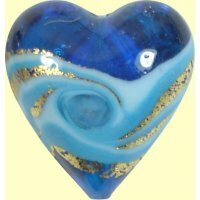 Black base with light and dark blue swirls over ye..
1 Karen Hill Tribe Hammered Heart Bead measure approx. 20x24x10mm so large enough to be focals ..